We’re collecting your stories and photos. Welcome. Thanks for your interest in the history of West Asheville and helping to preserve the stories and photos of our past to share with our future. We are continually adding more content highlighting places, people and organizations that have shaped West Asheville, along with the publications that have helped to tell those stories. Please join us by submitting information, photos, and personal stories of West Asheville. You can bring items to the North Carolina Room at Pack Memorial Library, 67 Haywood Street, Asheville, NC or use our online form. To submit a West Asheville Moment online, click here. 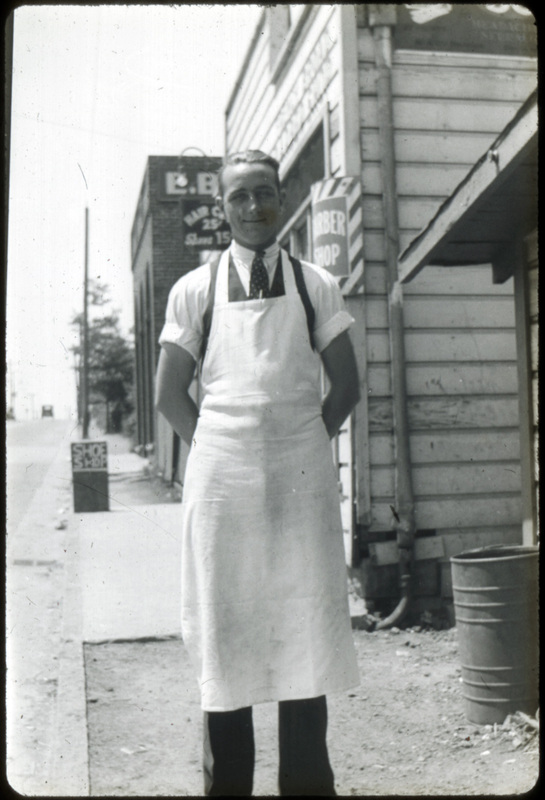 Ferrell W. Harper, clerk, outside Lawrence Grocery Store at 219 Haywood Road. Signs behind Harper are for Ball’s Barber Shop, owned by Enoch G. Ball, located at 225 Haywood Road. Lawrence Grocery operated at this location from 1935-1955. Interest in the collection and preservation of West Asheville history has been ongoing and widely supported by many community members, the West Asheville Branch Library, Pack Memorial Library, and the West Asheville Business Association for many years. So why WestAshevilleHistory.org? This site was born from collaborative brainstorming and a desire to make the vast collections of information about West Asheville available in an interactive way that directly associates historic places and people to existing locations in West Asheville. We also saw this as an opportunity to engage new audiences and expand existing collections by actively asking for contributions from the community. This site is designed to grow with our community and provide a way to share the moments in history that help define West Asheville - past, present, and future. The North Carolina Room’s mission is to collect, preserve, and provide access to the history of Buncombe County and the surrounding area. We are proud of our historical resources and are committed to preserving them for the future and making them easily accessible to the public. © 2019 West Asheville Business Association. All rights reserved.